As a Creighton Global Scholar, you will be well positioned to live, work, compete and collaborate anywhere in the world as a thoughtful, educated and experienced global citizen. 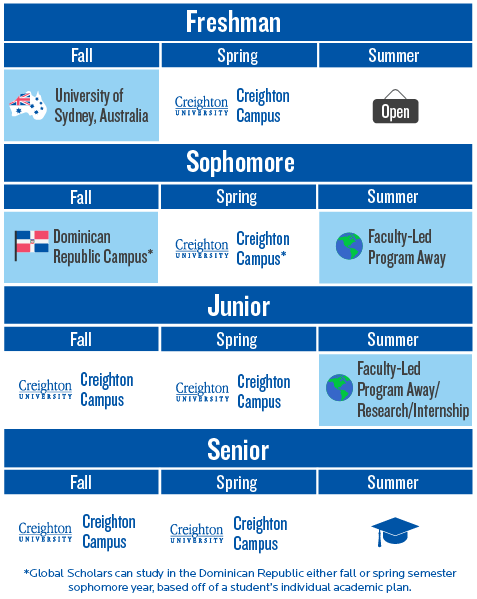 Creighton’s Global Scholars Program is a four-year educational and professional development program. It is designed to immerse select students in a variety of cultures for a rich academic, social and service experience where you will build networks with other students, faculty and alumni from around the world. Through language study, specialized coursework, service-learning, research, internships, and interaction with leaders in the global community, Creighton Global Scholars will become experienced global citizens, ready for employment in international organizations upon graduation. As a Global Scholar, you will complete a minimum of four global experiences during your time at Creighton, as well as a special companion seminar each semester to continually integrate global learning into each student’s major. These experiences are designed to immerse you in a diverse mix of experiences and traditions that provide a unique and rich lens through which to focus your major studies. Students with a minimum of a 3.3 weighted GPA and either a 23 ACT or 1140 SAT score* are invited to apply to the Global Scholars Program. Due to course requirements and sequencing, only certain majors are eligible to participate in the program. Direct-entry nursing students are not eligible for the Global Scholars Program. Pre-health students should speak with their admissions counselor about what this program looks like alongside a pre-health track. *Neither the ACT nor SAT score can be superscored for Global Scholars eligibility. The score must meet the minimum from one single testing date. Submit a completed Creighton University Application for Undergraduate Admission, including all supporting materials by December 1, 2018. Submit the Global Scholars Program application and all your supporting materials by Sunday, January 6, 2019 at 11:59 PM (in your local time zone). You can access the Global Scholars Program application through your student portal. All eligible applicants are required to complete an interview. Interviews will be conducted on campus during the Special Programs Day held on Sunday, January 27, 2019. Applicants are highly encouraged to attend Special Programs Day. For students who are unable to attend, phone interviews will be available January 14-25, 2019. $7,500 per year, in addition to Creighton’s tuition, fees, room and board. This cost includes all visas, flights, and health insurance involved in program-related travel, as well as specialized advising, workshops, and guest speakers, in Omaha and overseas. Students will be responsible for books and spending money. Additionally, students in this program will be eligible for a limited tuition waiver. Creighton Global Scholars in good standing will not be charged tuition above and beyond the standard full-time tuition for a given semester, regardless of the number of credit hours they are taking. Their eligibility to register for more than 18 hours will be subject to the approval of the Vice Provost for Global Engagement approval. Students should get a tuition waiver letter from the Global Scholars Program Director.